The report Post-deportation Health: A Humanitarian Assessment deals with the health impacts of deportation. It shows increased physical and mental distress for deported immigrants with strong ties to US. Data gathered as part of a humanitarian assessment of deported men and women in Nogales, Sonora, Mexico, shows that US immigration-enforcement practices are an issue of public health and safety. The survey focused on immigrants who had lived in the United States for a number of years before removal. 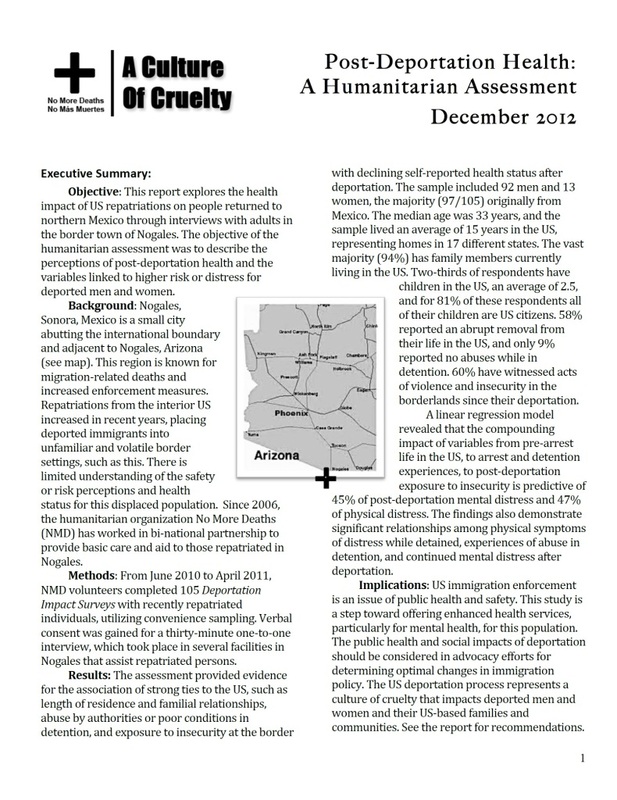 The findings linked poor post-deportation health status with strong ties to the US, experiences of abuse in detention, and exposure to violence at the border. The sample of 105 interviews included 92 men and 13 women, the majority originally from Mexico, with a median age of 33 years. The respondents had lived an average of 15 years in the US, with the vast majority of respondents (94%) having family members currently living in the US. Two-thirds had children in the US, an average of 2.5, and for 81% of those respondents, all of their children were US citizens. 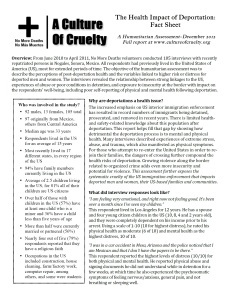 58% reported an abrupt removal from their life in the US and only 9% reported no abuses while in detention. 60% witnessed acts of violence and insecurity in the borderlands since their deportation. And the primary reason that most (70%) of the deported men and women would attempt to cross the border is to return to or support family in the US. A linear-regression model described the compounding impact of these variables on self-reported health status. Recommendations include suspending deportations of immigrants with strong ties to the US and enhanced health services for this population, among others. The report is part of the campaign launched by NMD with A Culture of Cruelty, in which we documented 30,000 cases of abuse of people in US Border Patrol custody.